Normally, dance is associated with fast beat music and precise choreography with dancers perspiring and gasping out for air. In the way of our fast-paced lives, there is a possiblity that we forget to breathe properly. Breathing is an important element of life, as the air we intake into our bodies gives life to our inner systems, not just physically, but more so spiritually. 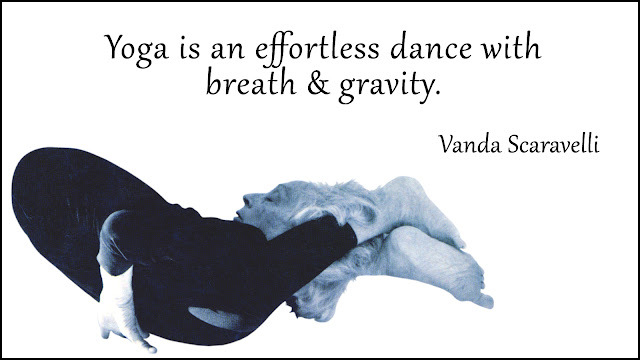 Yoga is deeper than just flexibility enhancer or relaxation of the mind and body. It may have its physical benefits, but what matters is what it inculcates in us deep within. It is not a religion Anyone can become a yogi and practice their own faith through its meditative techniques. The word actually means the union of a person's soul with the supreem spirit or God. Yoga originated from the foundations of Orthodox (idealistic) school in Indian Philosophy. Every posture or breathing in yoga that is being taught now has been based on India's earliest literature, the Vedas (knowledge). Bhakti Yoga is yoga by way of love and devotion. Extreme devotion is practiced in order to achieve concentration on one's concept of God. Karma Yoga is done through performing different acts of the mind centered on one's personal concept of God. Jnana Yoga is done through gaining more knowledge, wher our God and we will be one. Laya Yoga is for unleashing our "serpent power" or the seven chakras along the spinal column. At the base of our columnm, lies potential power. Through concentration, one awakens the serpent power to go up to the highrst center, which is th opening of the third eye. Mantra Yoga is the yoga of vibrations, which teaches that the union of God and man is brought about through the unity of vibrations. Raja Yoga is for the royals as it incorporates exercise and breathing practice with meditation and study. Thus, it helps in enhancing a person's well-roundedness. Hatha Yoga consists of physical movements and postures togther with breathing techniques. This is the most common yoga practice in the gyms. A modern variation of this is the Bikram Yoga, which consists of 26 postures and 2 breathing exercises done in a heated room for 90 minutes for detoxification. Kripalu Yoga leads us to a path for deeper self-inquiry, integrating our inquiries into the nature of the five Koshas, which are the layers of the mind-body. Tantra Yoga is the oldest form of yoga that has been developed 7000 years ago. This is mainly for meditation. Vinyasa Yoga is the integration of breath and movement, awareness and alignment, strength and flexibility, which connects the postures through the breath for a cleansing and stabilizing effect. So far, not all kinds of yoga that has been ennumerated above are available in the Philipines. There may be other variations which are combination of one or two kinds mentioned above. In the FLOW, the 3rd weekend long Mind and Body Conference held last September 19-20 at the Valley in New Manila, different types of yoga classes avaialbe have been featured. So to all dance professionals and enthusiasts out there, after almost wearing out your muscles and joints through rigid practices for a show, yoga is the best way to relaz as you breathe in new energy you can utilize for another practice or event. Not only do we feel the energy but also the iner strength to do more and be more in life. Villaba, Magdalena. Philosophy of the East. Manila: UST Publishing House, 1996. No Author. The "FLOW" Sessions. Retrieved August 22, 2009 from http://mindbodyphils.yolasite.com/mbc3sessions.php.